Once you learn how to ride a bike you will never forget it, right? Unfortunately, that's not always the case, sometimes it takes a bit of brushing up, a few tips, and a bit of practice to get back the confidence you once had. The good news is that there are a few easy tips that will make your reintroduction to cycling that bit easier. So you want to get a new bike - what's the bike for you? There are many different types of bicycles out there so what you need to ask yourself is where do you want to cycle? If you are interested in cycling on the road mostly, and want to be comfortable, then you want a hybrid bike which has flat handlebars and smooth tyres, if you want to go fast, you need a racer! If you are more interested in cycling offroad then you want a mountain bike with knobbly tyres and better suspension. When buying a new bike the best thing to do is pop into your local shop and ask for advice. There are hundreds of bike shops around the country, with extremely experienced people willing to help. You're about to do your first cycling event, what do you need to bring? First of all you need to think about safety. You need your bike, your helmet, and a high visibility jacket or vest. Bear in mind that your bike may have been sitting in the shed for weeks, months, maybe even years!! Make sure your bike is in good working order, and the correct size for you before taking it out on the roads or trails. Also, have a look at the weather forecast before you leave, and dress appropriately - we always recommend bringing a light raincoat in your pocket or bag... as you just never know!! You might also notice that many cyclists always wear gloves/mitts! There are two reasons for this - one is that if you do by some chance come off the bike, your instinct is to put your hand out, and you don't want to cut the palm of your hand!! The second reason is that your hands (and your feet) will always be cold if it is cold outside! So make sure that you have a warm pair of gloves/mitts to wear if it is winter time. But ensure that they are flexible, so that you can still pull your brakes! We have put together a really easy guide for you to use when checking your bike, as you want to ensure the brakes are working, the gears move smoothly, and the tyres are nicely pumped. Another very important safety consideration is to make sure that your helmet is the right fit and that you wear it correctly. Depending on the length of the cycle, we always recommend that you bring with you at least a bottle of water. Most bikes come with what we call a bike cage to store your water bottle. When you are cycling make sure that you consume plenty of fluid in the 2-3 hours beforehand, and then during the cycle drink at least 150ml every 15-20 minutes. This will make sure that you don't get dehydrated on the bike. If you are cycling for more than an hour make sure that you bring some food with you too - a banana is often the best thing to bring to top up your energy stores. For information on nutrition for bigger cycling challenges you will find this NUTRITION GUIDE useful. It is also worth practicing drinking before doing a group cycle, as sometimes it can feel a bit unusual or tricky taking out the bottle or food and having a drink, while keeping the bike going straight. 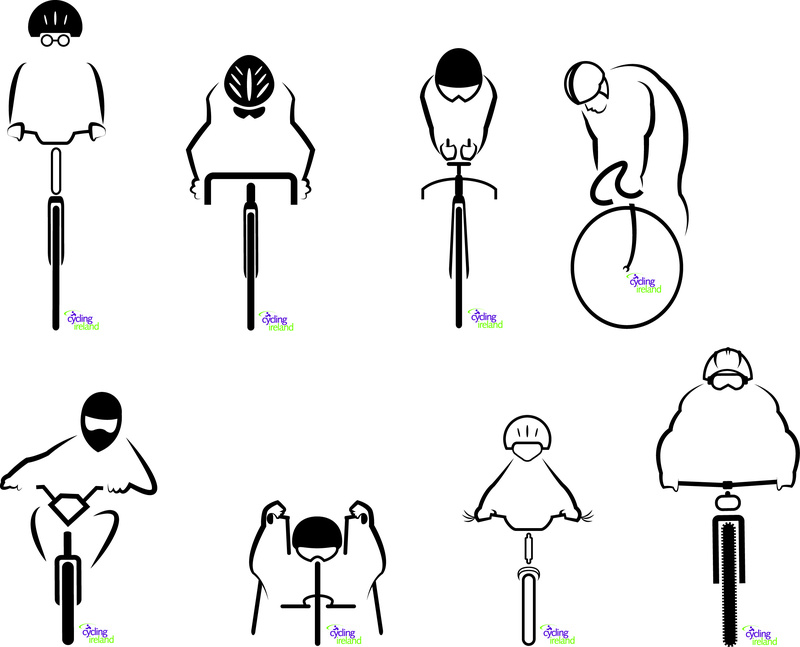 There are a number of games that you can play to build up these skills, which are listed below in the bike handling guides. Mass participation cycles, what do I need to think about? If you are embarking on your first group cycle, whether it is a local 10km family cycle, or a longer challenge, it's always really useful to work on your cornering. While cycling in a commuting capacity focuses on skills like how to cycle with traffic, and using hand signals as indicators, cycling in a bunch requires a slightly different focus. You need to make sure that you make no sudden movements without ensuring that it is safe to do so. For example if you suddenly swing out to the right you run the risk of "taking out" a rider behind you who isn't expecting this sudden move. You may want to work on your observation skills for this reason. Another skill that you might want to work on is your bike handling skills, as on a mass participation cycle you will be moving around in the group. Once you are comfortable with how you can cycle your bike, you will be confident to deal with any situation that might occur. Always cover your brakes, in case you need to stop suddenly. We always recommend that you keep your hands wrapped around the handlebar, with one/two fingers covering the brakes. This means that you can always react to sudden movements, while having a firm grip on the bike at all times. Never trust anybody with your safety, check it out yourself. You might notice that a few riders in front of you pull out to the right or left, and feel like following them, don't trust that the way is clear for you too, look for yourself. Always look in the direction of travel, whether you are going on straight, or around a corner. Your bike will follow where you look. Whatever you do, don't look down! Even if you get tired, make sure you keep looking up, as you need to see where you are going.